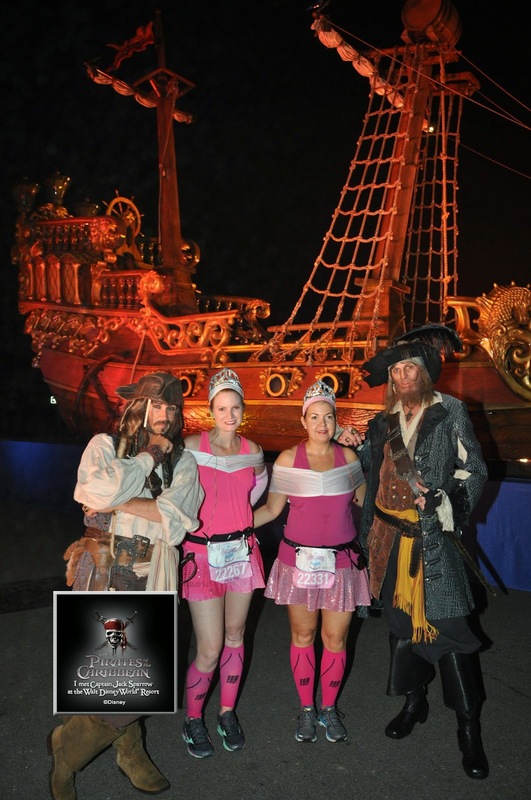 This Sunday, I ran the 2014 runDisney Princess Half Marathon, a race I only dreamed of participating in after witnessing it in 2012. 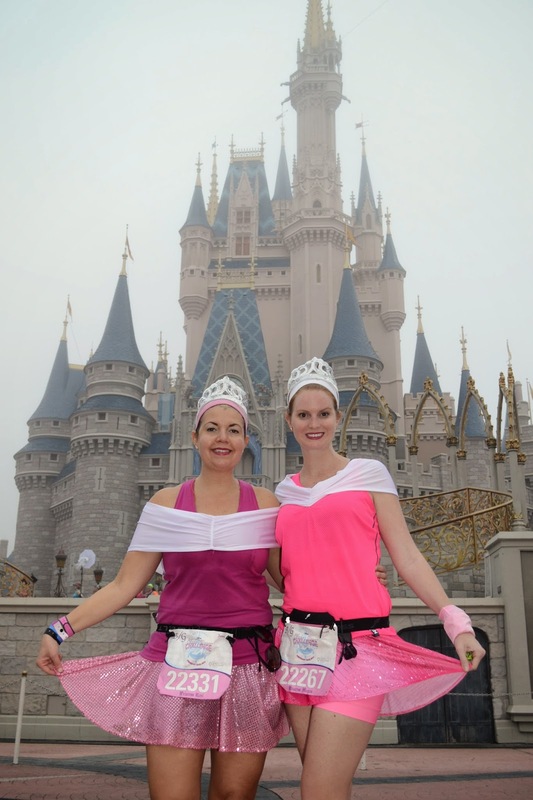 Two years ago this weekend, I ran my very first 5K and watched my best friend complete her first 1/2 marathon, at the 2012 Princess Half Marathon weekend. The rest is history. The video above was taken from the start of the half marathon - I had the gracious opportunity to witness the elite runners and Corral A start the race. It was unlike anything I have ever seen in person and the video does not do it justice. My best friend Keri dressed me for this race. 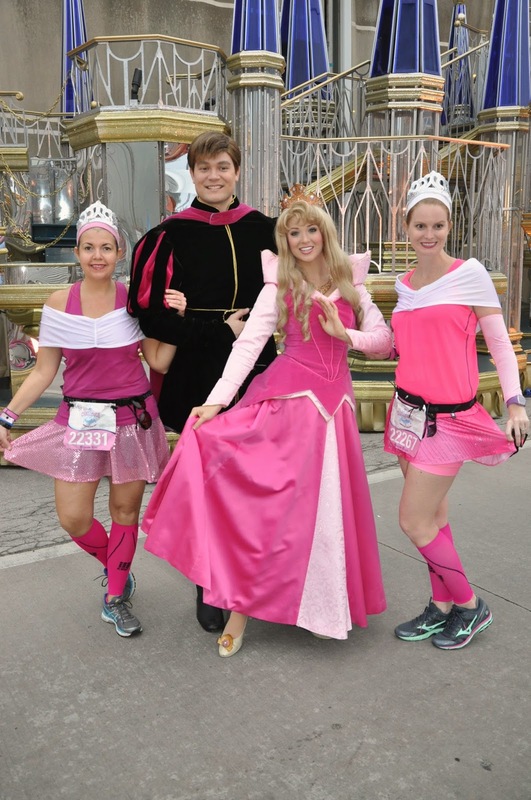 We were Princess Aurora....I never thought I would wear lipstick at a race, but there is always a first for everything. We started the race running the first two miles with runDisney trainer Jeff Galloway. We dropped off the Galloway train at the first photo opp. One thing Keri and I agreed on was that we would stop for every photo opp that either of us wanted, regardless of the line. We did just that and received a near 4 hour finish time. I do not regret it though - we were there for fun, not trying to get a PR. 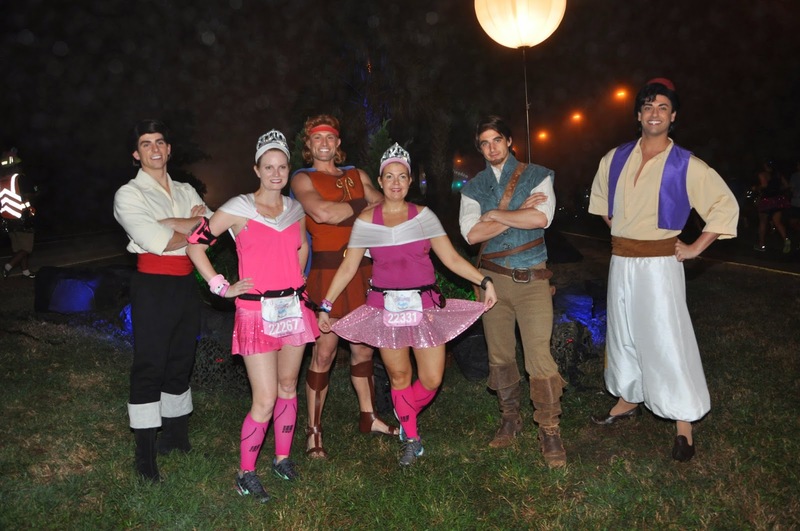 This is why we run Disney - to enjoy all of the on course entertainment. We took advantage of early short lines by stopping for photo opps and when I saw Jack Sparrow with only 3 people in line, we jumped in. The next photo stop was the princes. I felt bad for Aladdin as he didn't have a princess in the photo! I will take this moment to discuss how hot and humid this morning was. Fog everywhere, unable to breathe and sweat within the first few minutes. February in FL was not kind to us this morning. We rounded mile 3 and saw the evil queens. The line was pretty long but I forced Keri to stay for this one. I knew by the time we hit Magic Kingdom, the lines for Prince Mickey and Princess Minnie would be long - and this is one photo I had to have. And we had to sit in the evil chair. I am 4" taller than Keri yet look so short compared to her in this photo! Once the sun rose, the fog did not let up. It was unbelievably foggy when we hit the Magic Kingdom. I started getting very cranky at this point. I mean - VERY cranky. Everyone around me annoyed me and I felt out of character. 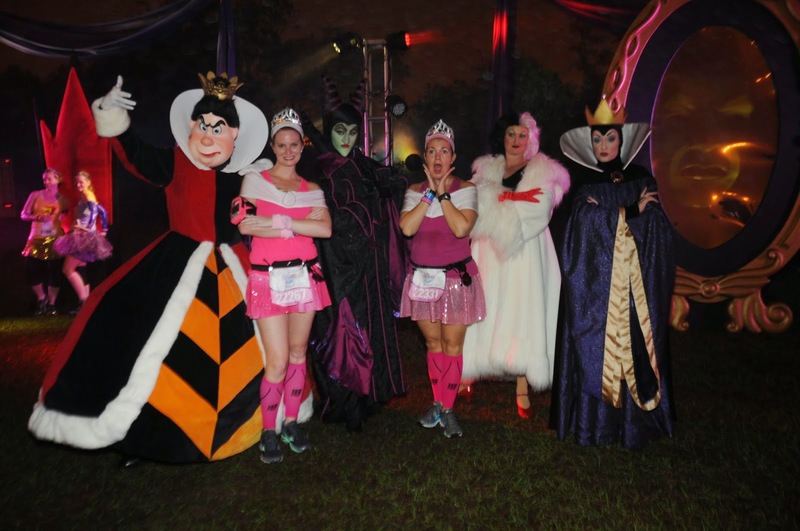 I am not one to throw hissy fits inside of Disney, especially at runDisney events. I even told Keri I was going to pop some random girls balloons because she was trying to scare people by thinking she was a balloon lady - to which Keri responded "what if it is her birthday?". I glared at her. When we arrived in the new Fantasy Land, there was a line so long that it didn't make sense. That's when we learned it was Prince Mickey and Princess Minnie. Construction on Cinderella's Castle prevented them from being at their normal spot. This is the one photo I promised Keri we would take, no matter what. 20+ minutes later, we got the photo. It was worth it standing in line for the photo for us as we were already way behind pace due to the prior photo opps. We decided to run through the rest of the Magic Kingdom, We passed Princess Tiana and Louis the alligator. Once we got to the back side of Magic Kingdom, we saw another long line and a lot of pink. It was Princess Aurora and we had no choice but to wait for this photo. This is about the time when my crankiness mentioned above was explained. Let's just say it's a girls worst nightmare while running a half marathon. Once we exited Magic Kingdom, we saw another line - this one was about 10 minutes long. It was Mary Poppins and I insisted we stop for this. Plus my ovaries were screaming at me to stop for a second to take some tylenol. I really needed a spoon full of sugar to help the medicine go down...... Superfragilisticexpialidocious! Then we heard some singing! These fine gentlemen were serenading the ladies (and men!) while presenting them with a glass slipper. This was a funny moment in our day and I was in lala land thanks to a 1000mg tylenol. I took my photo and grabbed the phone from Keri, suddenly hearing my name. I look up and see my friend Heidi and her husband. I take off, leaving poor Keri alone with no photographer. Oops. I went back for her and got a ton of crap from the singing guys and everyone around us for leaving her stranded. I don't think I spoke to Keri from mile 8-10. I was having horrid cramps. All I wanted to do was to have this half marathon over with, find a heating pad and lay down. Meanwhile, Keri wanted to finish and drink champagne. I also agreed with her wants and needs. We finally made it to Epcot and finished the 13.1. When I said nearly 4 hours, I was not kidding. 3:55 or something like that. But we took a ton of photos and had a good time with the race (except my 2 mile silent treatment - sorry Keri!!!). My verdict on this race weekend is that it is a must do for any female runner. If you are someone looking for inspiration to start running, sign up for the Royal Family 5K - look what it did for me! Two years later, I have completed 2 full marathons, 8 half marathons, a 10 miler and countless 5K & 10K's. Princess Half Weekend is also the perfect girls weekend out and I had an amazing time with my BFF. 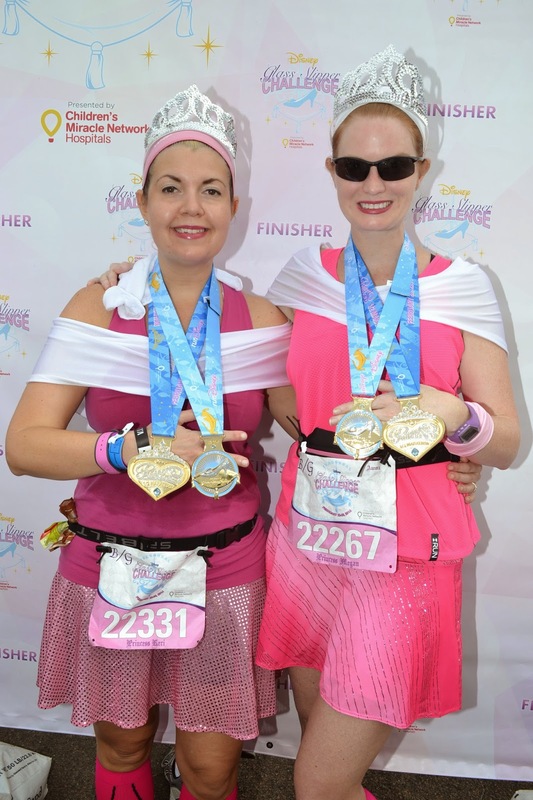 runDisney Princess Half Marathon weekend is the reason I became a runner and if it weren't for that magical day in 2012, this blog would not exist! I fully intend to have fun for Dopey. No rushing, all fun and smiles. That was my plan for Princess, but sometimes your running partner does not have the same idea of fun as you do. I should have found you girls for the race. Until 2 weeks before the race I had planned on being Aurora too!